You can sync the contents of Bookends for iOS with the cloud, from where they can sync with other iOS devices or with Bookends for Mac. Typically you will already have a Bookends library on Mac that you want to sync with your iOS device. In this case, make sure it has been uploaded to the cloud before setting up Bookends for iOS sync. 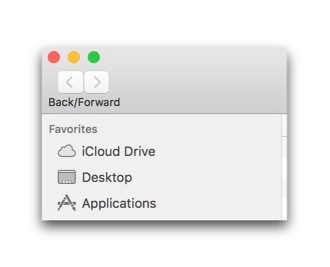 To do this, on your Mac click on the Bookends cloud icon at the lower left corner of the window and “Sign In To Cloud..."
Start Cloud Sync in Bookends for iOS by tapping on the top right button ("…”) or tapping “Sync” under the “Bookends” section on the main screen. 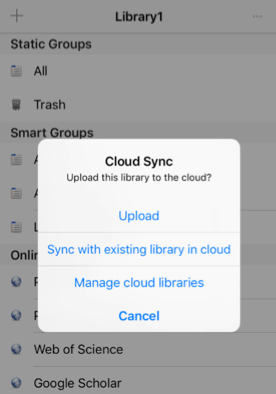 After the first successful sync the library will be synced automatically every time the app is launched and closed. In addition, you can sync manually any time by tapping the … button and selecting Sync Now. After every successful sync of references, Bookends will start syncing attached files, usually PDFs. To create the Bookends iOS sync folder on your Mac, you must perform a few extra steps. • The Bookends for iOS library should be synced with cloud. • Download any reference with attachments from any online source you have privileges for (e.g. PubMed or PubMed Central) in Bookends for iOS. Import this reference to your library. • The Bookends folder with this new attachment should be created by macOS on every one of your Macs. 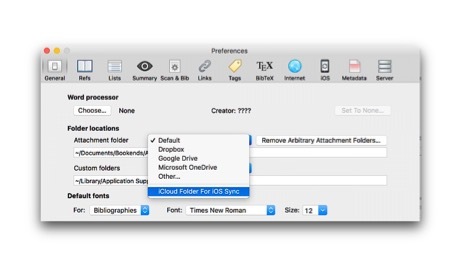 • In preferences, set your default attachment folder to iCloud Drive. Important note: Do NOT create the iCloud Drive Bookends folder yourself in the Finder. If you do it will not have the Bookends icon and it will not be recognized by Bookends for iOS. You must let Bookends create the folder for you as described above. If you have pre-existing attachments on the Mac, you must go to the Finder and move them from their current location to the Bookends iCloud sync folder (the one with the Bookends icon). 1. Turn off iCloud Drive in iOS Settings. 3. Open Settings and turn iCloud Drive on. Currently, Bookends for iOS will download files from iCloud Drive -> Bookends folder if they are 50 MB or smaller. As files are downloaded in the background by iOS, it may take some time until you see the attachments in Bookends for iOS. Note that smart groups on the Mac will not sync with Bookends for iOS and vice versa. The search capabilities are far more extensive on the Mac and can’t be duplicated in Bookends for iOS.